Table lamps often fall into the "accessory" category. This tends to make them an afterthought in the design process. But, sometimes, they can be a star and even drive the design direction a room takes or steal the show. 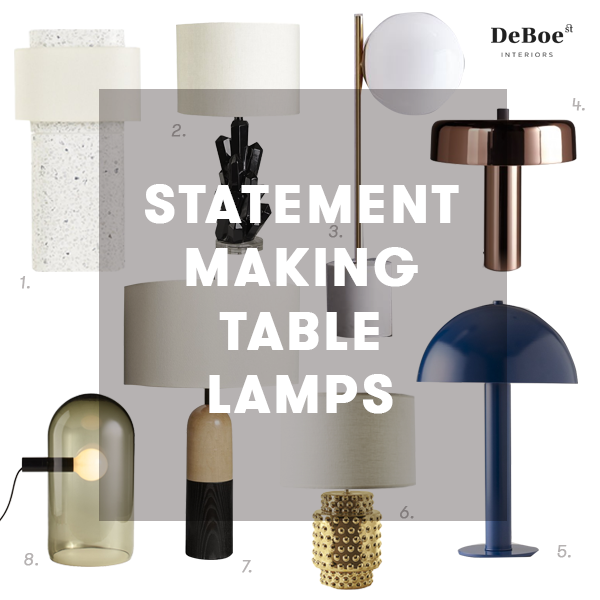 I've rounded up eight lamps that are inspiring our designs right now. When I look at these lamps, I just get giddy imagining the room they are a part of, it's got to be a fabulous room, no? What do you think? Do you buy lamps first or last when you're assembling a room? Do you tend towards a "safe" or neutral style lamp or go bold? We'll continue the conversation over on our Instagram account, check it out and let us know if you like any of these and/or how you choose lamps.